Los Angeles, CA — September 2016… You can tell when you hear his music that musician and producer Pablo Stennett puts heart and soul into everything he does. 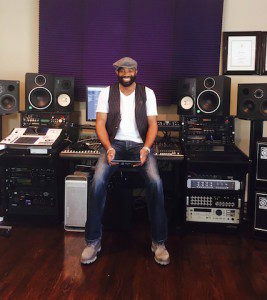 The multiple Grammy winning musician/producer’s list of credits is as lengthy as it is diverse, from Ziggy Marley, Jimmy Cliff, and Raphael Saadiq to Willie Nelson, Chaka Khan, and Pink. He’s got an ear for detail and his reputation depends on great sound. And in his studio, he relies on Mackie’s award-winning DL32R 32-Channel Rackmount Digital Mixer for tracking and wireless mixing. Stennett has been getting a lot of attention lately for his recently completed project with up-and-coming singer Emree Franklin. Her new single, We Are Tomorrow, has met with critical acclaim. As with most of his own productions, the project was recorded at Stennett’s personal studio in Southern California, tracked and mixed on his DL32R.